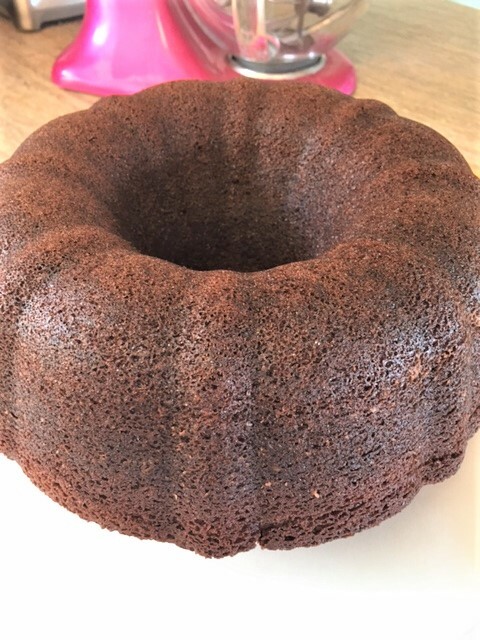 If you love brownies and you love cake….oh, and if you love chocolate, you will love this cake. This is a seriously good cake. You’re going to love how easy this is too. I don’t care much for a boxed cake mix. But when you combine it with a box of brownie mix…………Holy crap!!!!! The cake is so good by itself, but I drizzled some chocolate ganache on it. But wait…..that’s not all. 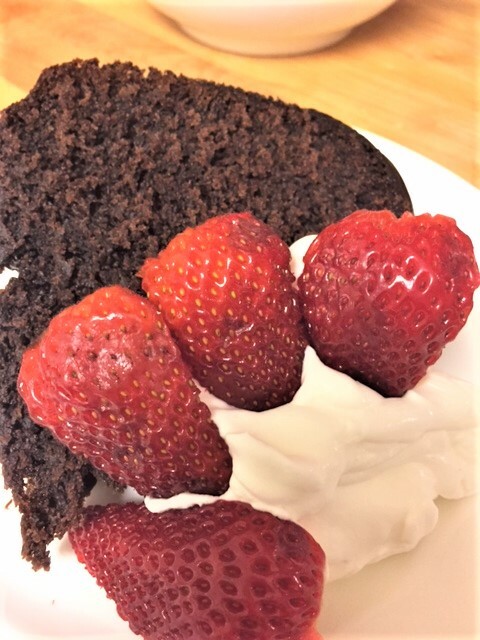 I then put a big dollop of whip cream and some fresh strawberries. YUMMMMMMM. Just so you know, this cake is not my recipe. I found this on line. But I did add some instant coffee to my batter. It doesn’t give the cake a coffee flavor. It just enhances the chocolate! It’s a pretty cake too….so pretty, you wont want to cut into it. But you will and then you will be so happy. Let’s bake a cake. Heat oven to 350. Spray a bundt pan with non stick spray. In a bowl, mix together the cake mix, brownie mix, eggs, oil and water. 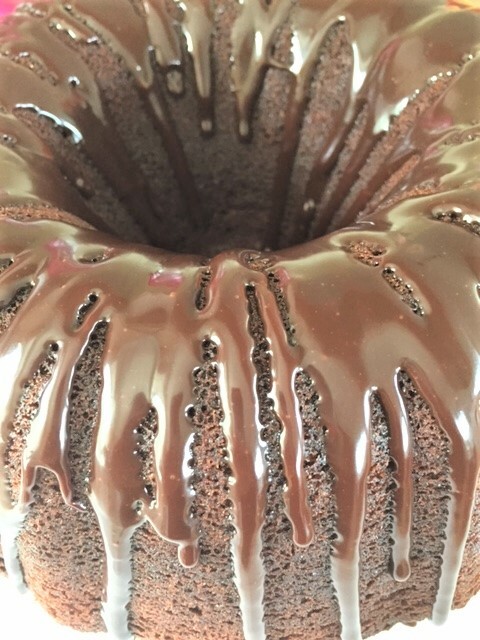 Once it’s all smooth, pour it into the bundt pan. Bake for 40-50 minutes, depending on your oven. 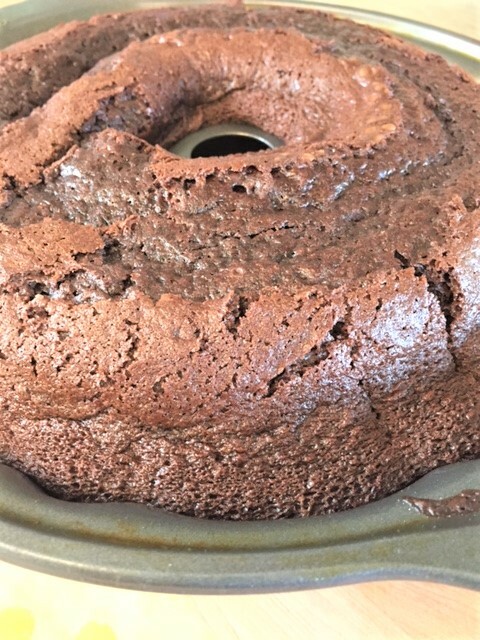 Allow the cake to cool and turn out onto a platter. Be sure it’s completely cool before frosting. 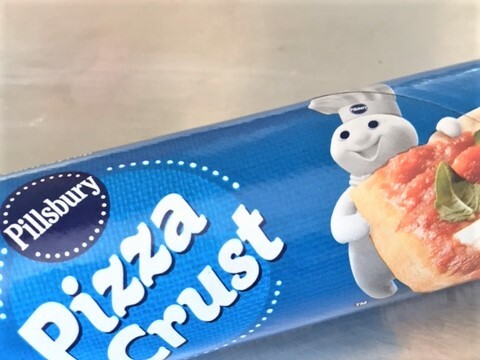 Heat the tub of frosting in the microwave, for about 15-20 seconds or until its thin enough to drizzle. 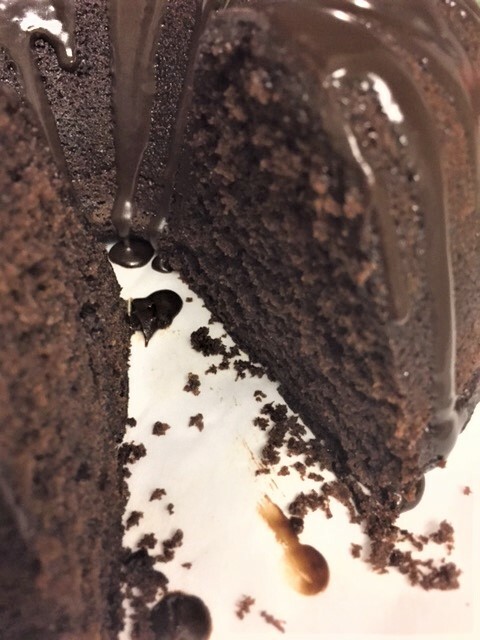 Drizzle it all over the top of the cake. I find this too sweet. I really don’t like frosting in a can. 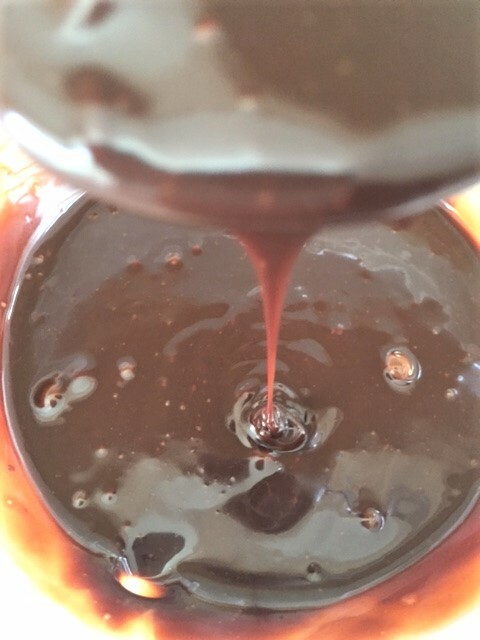 I make ganache, which is simply hot cream mixed with some chopped chocolate or chocolate chips. Serve with some whip cream, fresh berries, ice cream, etc. Mmm-m-m-mmmm. 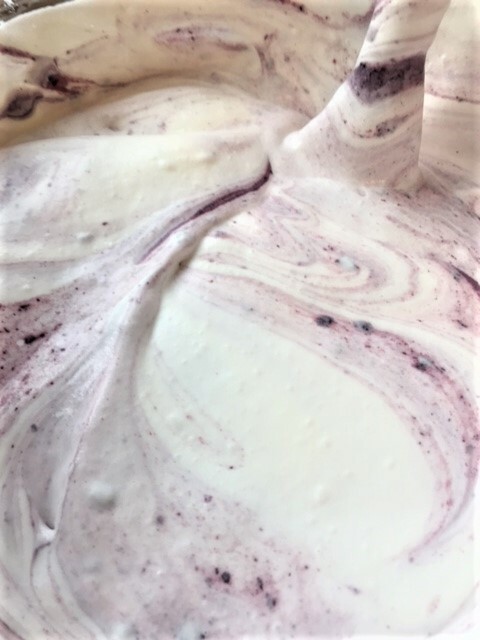 No Churn Easy Blackberry Ice Cream……..
OK! OK! OMG, I am so excited. I mean like realllllllly excited. Don’t laugh. You’ll see why! I love, love, ice cream. I actually love to make homemade ice cream. But, seriously……it is a bit of a pain. You have to make the custard, let it chill….and I am NOT good at waiting. For some time now, I have been hearing about and reading about no churn ice cream. “Hmmm,” I said to myself. “how good can that really be? ” It’s not churned! I was doubtful. So I decided I wasn’t going to try it. Welllll, I changed my mind. 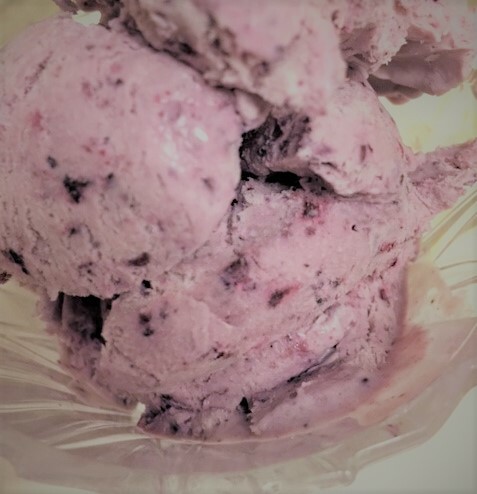 I saw a recipe for a no churn blackberry ice cream. I LOVE, LOVE blackberry ice cream! 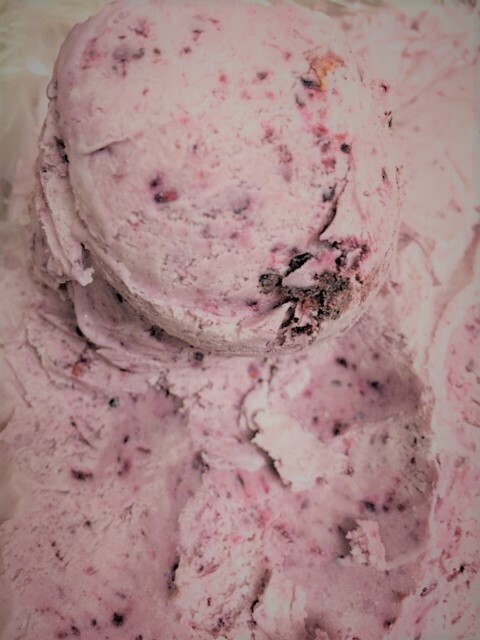 Awhile back, I did a post here on my blog for a churned blackberry ice cream. It’s delicious, but I decided to give this no churn thing a try. I thought, what the heck….just try it. Holy crap!!!!! Why did I wait so long! WHY!!!!! 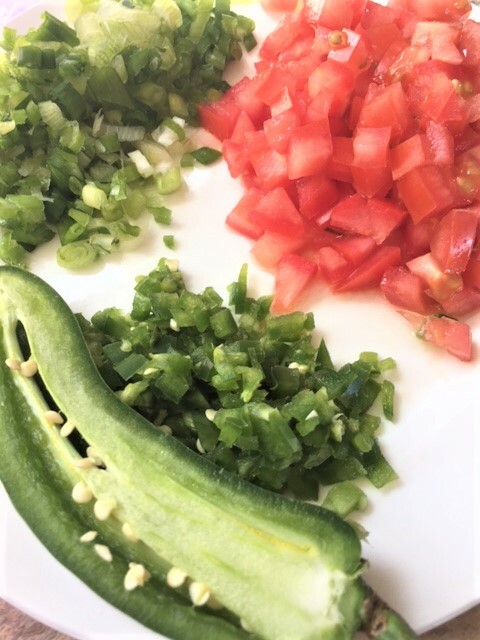 It was so easy…..SO easy, quick and absolutely delicious. Really…..this stuff is so good. It’s creamy and I love it every bit as much as my time-consuming ice cream maker, ice cream. I’m already thinking of other flavors……espresso chocolate chip…..strawberry…..peach……rocky road….Oh my. So, you must make this. You only need 2 ingredients and whatever flavorings or fruit that you want. You’re excited, right? Yes!!! I know you are! If using fresh berries: Place your berries in a food processor or blender. Pulse until smooth. 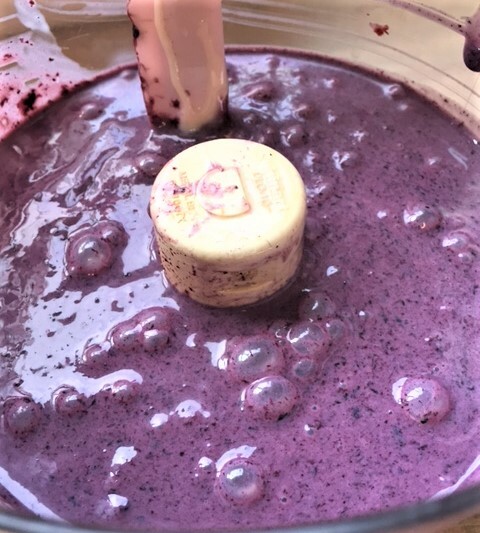 If using frozen berries: Allow the berries to thaw. Once thawed, drain the juice out. Put the berries into a food processor or blender and pulse until smooth. Add the sweetened condensed milk to the berries and pulse until the mixture is combined and smooth. Set aside. 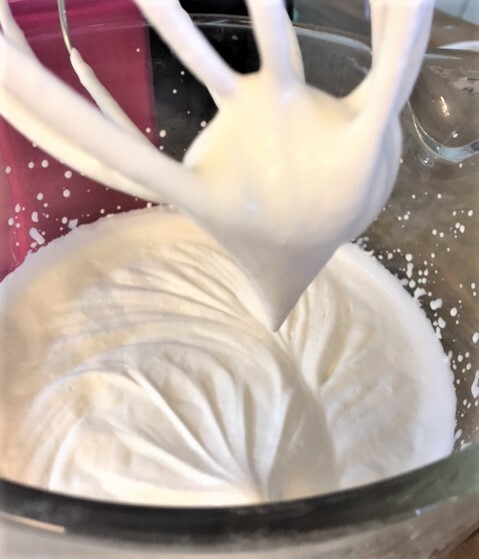 In a mixing bowl with whisk attachment, whip the heavy cream until soft peaks form. Fold the berry mixture into the cream. Fold until the mixture is smooth. Pour into a loaf pan. Chill for at least 5 hours. That’s the hard part……waiting so long. But it’s worth it. A Different Kind of Pizza…………..
One of my most favorite restaurants ever, ever, was a place called Bruno’s. It’s no longer open, but I sure miss it. They had the best pizza, the best spaghetti in the world and the best chocolate cake you ever tasted. They would cut it up in little serve yourself squares. My friend Leslie and I would pile our plates with that cake and then complain later that we were overly stuffed. Everything they served there was good, but my favorite thing ever was this unusual pizza they made. They would always have four different kinds of pizza…all were good, but I only cared about this one pizza. It had no sauce and no cheese, so it wasn’t heavy. I’ve never seen any other restaurant serve it. It was a thin crust, brushed with olive oil. 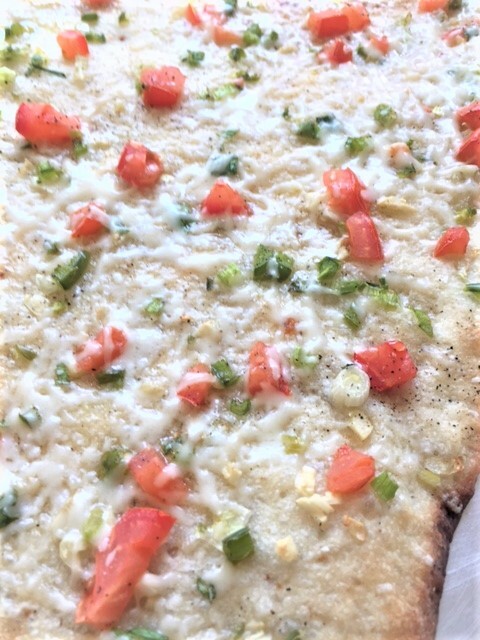 It had sprinkles of minced green onion, jalapeno and fresh tomato. Then it was sprinkled with some coarse salt and pepper. It was AMAZING. I started making it at home. A lot. It’s so easy and quick and cheap too! I sometimes make my own pizza dough, but I don’t know why. The store-bought pizza dough is great. I know it sounds bland and you’re probably thinking “WHAT? What’s pizza without cheese! 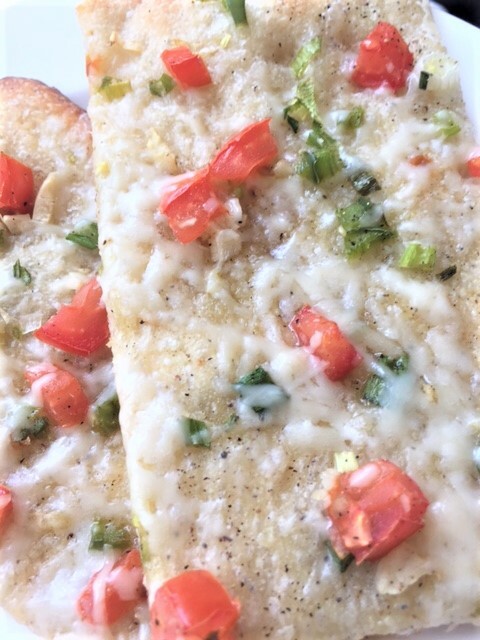 !” But trust me, this is such a good pizza and let me tell ya…….it goes great with a chilled glass of white wine. Yep! It really is the perfect pairing. Everyone I have ever made this pizza for, falls in love with it. You just can’t stop eating it! Then, of course, each bite is followed by a sip of wine and before you know it an entire pizza and bottle of wine is gone! But you will be so happy! Heat oven to 425. Spray a large baking sheet with non stick spray. 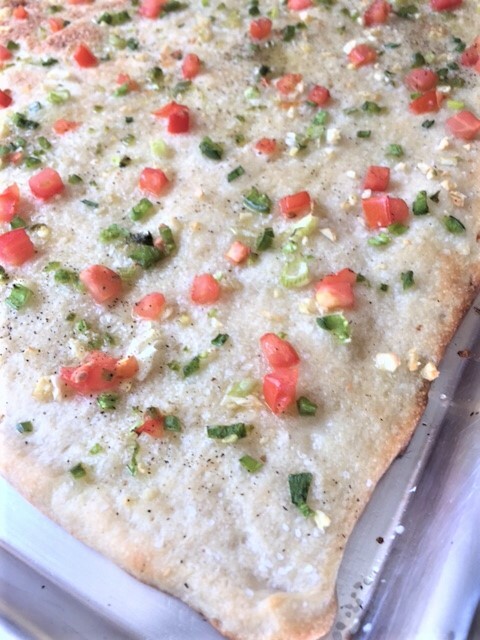 Remove pizza dough from container and carefully place it on a large baking sheet. Pat it all out evenly. Should be pretty thin. 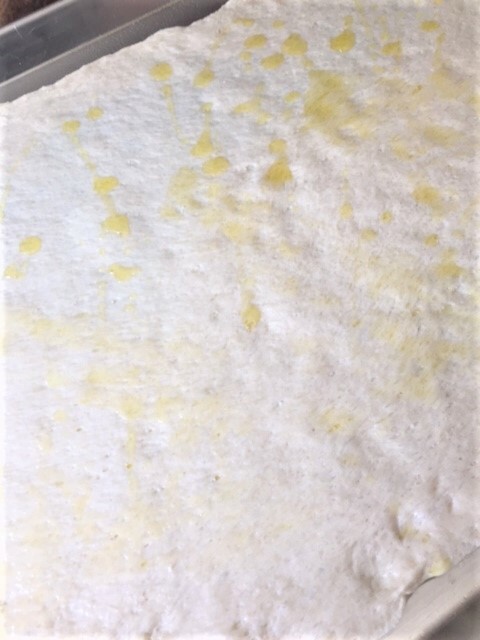 Drizzle the dough with olive oil (approx. 2 Tblsp). 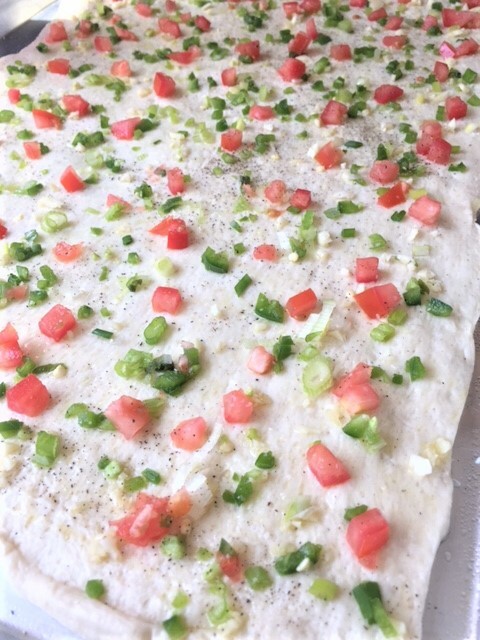 Sprinkle the tomato, green onion, garlic and jalapeno all over the top of the pizza dough. Sprinkle with salt and pepper. Bake for about 12 minutes or until it starts to look brown on the edges. Drizzle just a bit more olive oil all over. Serve immediately. If you really have to have a bit of cheese, sprinkle some parmesan on top, right after it comes out of the oven. Crack open a bottle of wine, pour a glass and enjoy with your pizza. Kale seems to be so popular these days. I’ve been eating it for years. My parents always grew it in the vegetable garden and they would prepare it in a big ol pot with collard greens and turnip greens. Oh, and lots of bacon or ham. I don’t think that’s the way most people eat it today. It’s known as a “healthy” thing these days. I know that kale is good for you, but I eat it because I really, really like it. 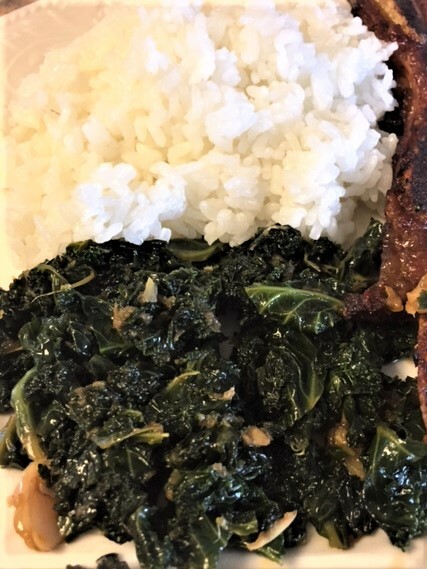 I recently tried a variety of kale that I had never heard of. It’s called Lacinato Kale, or Tuscan Kale. Apparently it’s very popular in Italian cooking. I love this stuff. It’s more mellow in flavor than the regular kale we are all used to. The stems don’t have to be discarded either, since they are really tender. It’s not as curly as regular kale either. If you see it in your local grocery store, I highly recommend it. 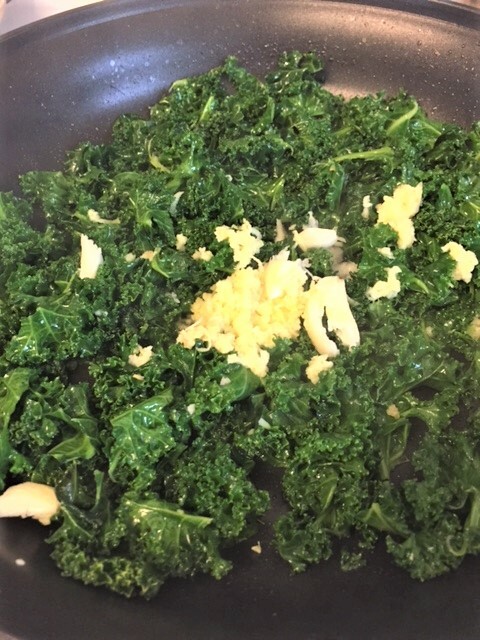 This side dish is great with either variety of kale, or even a mixture of both. It goes well with chicken, beef or fish. It’s also great on top of some rice. I hope you try it. 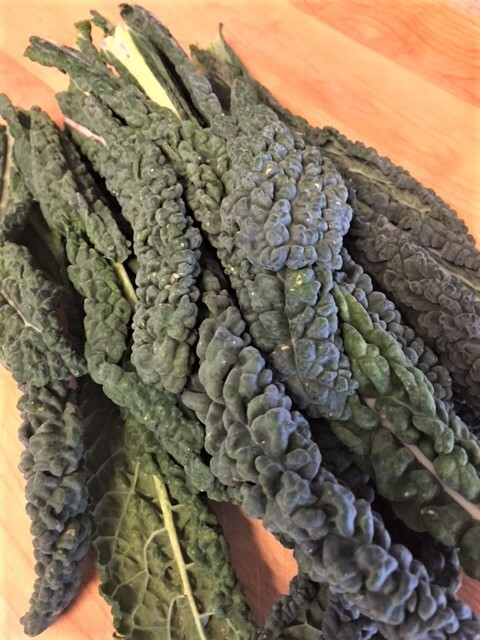 If you are using the regular kale, remove the leafy parts from the stems. Throw away the stems. If you are using the Lacinato kale, there is no need to tear the leafy parts off. Chop the kale into bite sized pieces. To a large skillet, on a medium heat, add some olive oil. Add the kale and saute until it starts to soften. Add the minced garlic, grated ginger and give it all a good mix until the texture is to your liking. Add the soy sauce and black pepper. If you like spicy, add some red pepper flakes. This is going to be a very short post. If you need a good side dish, and you love corn, this is for you. It’s not like the mushy, sweet creamed corn that you get in a can. I cannot stand the canned cream corn. 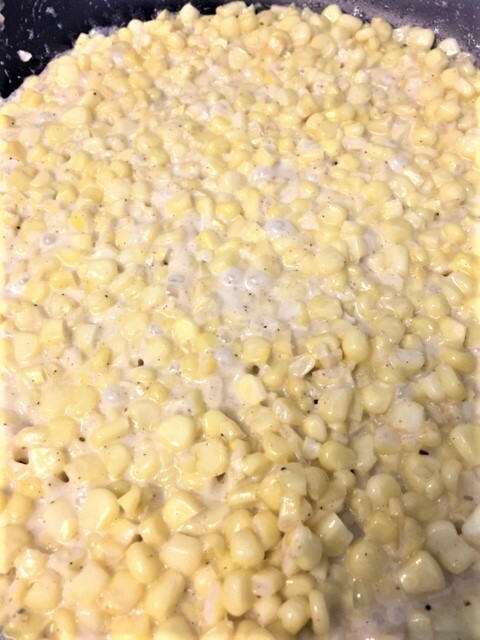 Fresh corn, some cream and butter. How simple is that?! There is a restaurant in Los Angeles, CA called Lawry’s. They are famous for their prime rib. It’s served with their house creamed corn. It’s so good and you want more and more of it. A server there told me what the ingredients are. I couldn’t believe how something that tasted that good, could be so simple. If you like your creamed corn on the sweet side, add a bit of sugar. But it’s really not necessary since corn is pretty sweet. Naturally sweet, crisp, buttery and creamy. Yum. Cut the kernels off the corn cob. In a large skillet, melt the 2 Tblsp of butter. Add the corn and saute for a couple of minutes. Add salt, pepper and cream. Stir and simmer until hot and slightly thickened. Add a tsp of sugar if you like your corn super sweet.